The New Issue of Twin Cities Veg Living Is Here! Want to learn how to get strong bones on a vegan diet? How female oppression and the dairy industry are interconnected? Why food access matters in creating a vegan world? Where to find the best vegan ice cream in the Twin Cities? The answers to all these questions and more can be found in the latest issue of Twin Cities Veg Living, our annual 12-page magazine that shows the how and why of compassionate living. 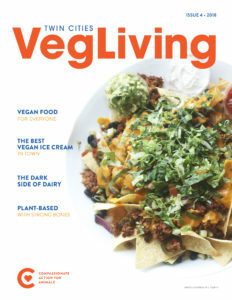 We hope this magazine will be a valuable resource not only for those who are new to the idea of being vegan but also to those who have been on the path for a long time. It’s chock-full of useful tidbits and inspiring stories. You can view the magazine online or pick it up at any of our CAA events throughout the coming year. If you know of a place that could use a little stack of magazines, let us know. We’re happy to get some there, or you can help distribute them for us. Big thanks to all of these individuals for participating in the creation of this new magazine: Robin Asbell, Laura Carroll, Danami Maurice Champion, Jenell Holden, Emily Kampa, Lola Levin, Laura Matanah, Matt Schroeder, Suzy Sorensen, and Laura vanZandt. We look forward to sharing the magazine throughout the year, educating others about the suffering of farmed animals and showing them how they can make a difference with their everyday choices. If you want to support the creation and distribution of Twin Cities Veg Living and other CAA outreach tools, please make a donation to CAA today and then join us on March 31 for our Annual Banquet, a benefit that supports all the work we do at Compassionate Action for Animals.